Taiwanese artist Tu Wei-Cheng likes to create illusions and hoaxes with his art. 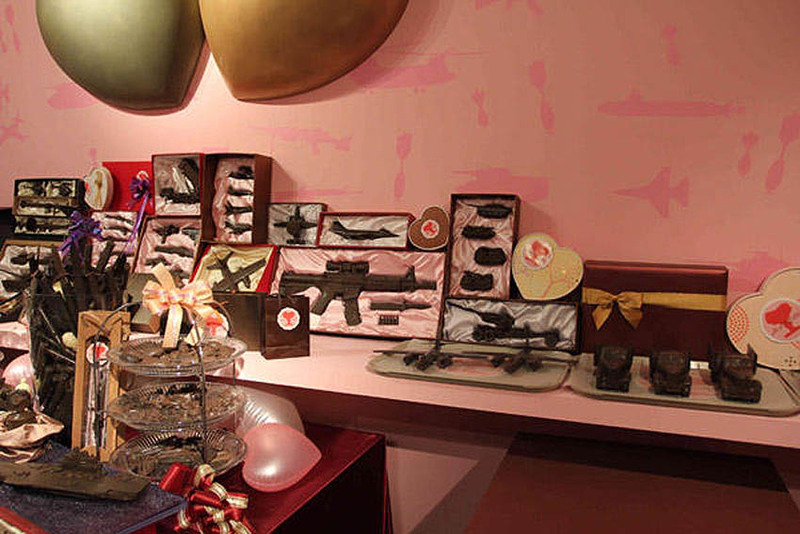 One such work is his large-scale installation titled Happy Valentine’s Day: a chocolate shop complete with hearts, ribbons and pink walls, except that the chocolate boxes are filled with tiny chocolate tanks, guns, hand grenades and other arms and artillery. All images courtesy of White Rabbit Gallery. This entry was posted in Art, Food, Industrial Design, Pop Culture. Bookmark the permalink. What a quirky twist on what is normally a pink and fluffy occasion. On first glance it looks like a girls idea of heaven with chocolate everywhere. Then you realise the formation of boys toys are included in its creation. I wonder if there are any Happy Valentines Day quotes in a message that includes these two parallels that could be sent along with such a mind blowing object. I also wonder what a recipient would think having received such a gift. Thank goodness this is art and not a new craze.